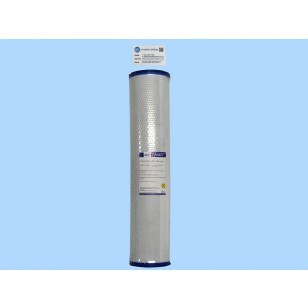 A high flow cartridge for removal of chlorine, pesticides & odor; improvement of taste. 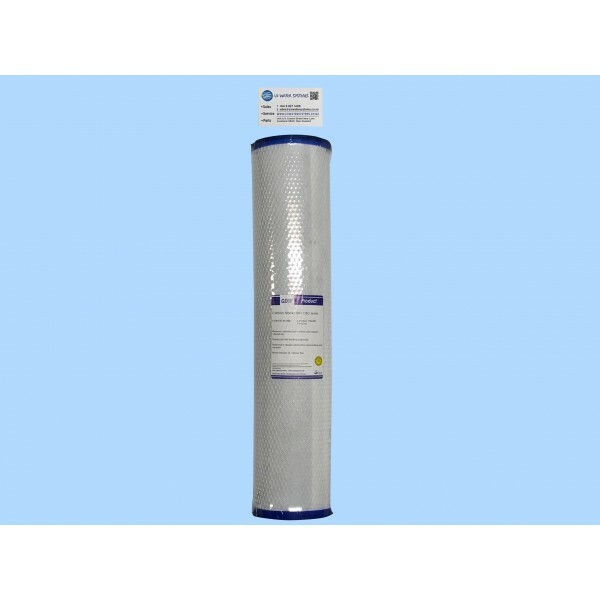 A high flow nominal 5 micron Carbon Block Cartridge, for removal of odors and improves taste. Also is effective for removing spray residues that might fall on your roof. Also two of these cartridges will eliminate Chlorine in City/Mains water. Note that the 'activated carbon' process works when the carbon particles touch the water. Fine silt/mud will coat the carbon and render the cartridge largely ineffective. Media material is from Coconut fibre, vastly superior to charcoal carbon, with superior life and reduced channeling. When fittings always relubricate the sump Oring and threads, to enable sealing from hand tightening the sump. This avoids flattening of the Oring due to 'overtight'. Always purge before finishing your systems cartridge change, to avoid unnecessary air spurting through your household taps. Sumps tighten from the effect of water pump pulsation.